Welcome back. Today at Celebrate the Occasion (CTO) we spotlighting birthdays with a twist. You must add "bling" to your project. This card was a lot of fun because I got to combine two of my favorite things; my Cricut and my love for coloring. For the image I used the Digi Doodle Shop. Please stop by there and see the lovely images. I would love to see what you create. So just link your project with CTO this week so we can visit you. Awe your image is super cute! Love the shape too! Great Job! Cute! Love all the scalloped layers! beautiful job!! love the image! Wonderful layering and the clown is so cute!!!! Great card! Love the clown. 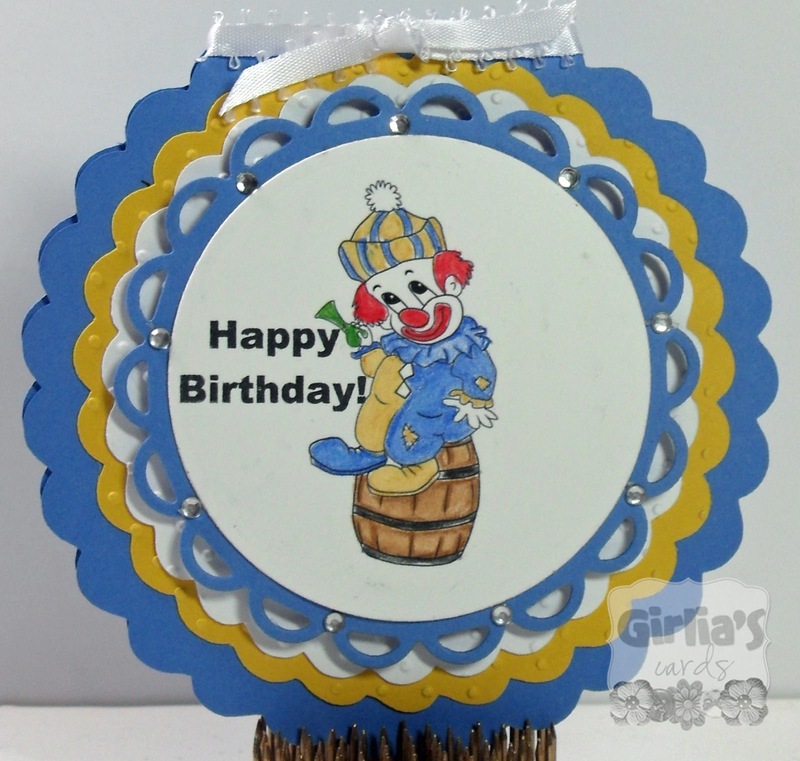 Wonderful coloring on the whimsical clown image. Gloria, this card is just toooo sweet, and I just love that image -- he's just absolutely adorable! Super cute card love the image,Thank you so much for the award and thinking of me. I will be posting it on my blog soon. He is just too adorable and the card base is just perfect! This is super fun! Great shape and layers! 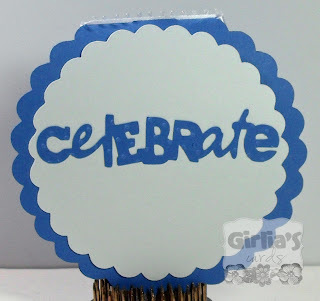 I hope you will come on over and enter this cutie at the CCR Shape card challenge, deets are on my blog right sidebar! Love your card! The image is adorable and the card design is awesome! Love that you have use circles and the colours and combos. Cute image too well coloured. ty for leaving me some love on my hippo centre piece, I love to read your comments of encouragement :) HAVE A SCRAP HAPPY DAY! Cute card! I love the layers. Thanks for sharing with us at Creative Cutter Room. Very cute card!! I had always thought i was a follower of your blog....I must have missed this one! Thank you for always stopping by and showing me love!! Now i am following you so i will be back!! Have a blessed weekend!! Great card!! That is such a cute clown!! How awesome is this shape and how awesome is that clown!!! So glad you entered this card!! thanks so much for joining us at the CCR!!! THis is such a cute card! I too ADORE shaped cards!! Great job on this, it is just adorable! Adorable card! Thanks for joining us at the CCR! Hi, Gloria! Just roaming through the neighborhood and wanted to drop in to just say "hi"! I love the layering for this card and the stamped image. Wonderful job! Thank you for the inspiration! That digi image is so adorable! Thanks for the link to where you got it. Lovely coloring - I need to learn from you as I just started playing with some I have purchased 3 months ago. And a great job at coloring you did! Adorable card!! Aww...this reminds me of my childhood. Adorable card! Super adorable card, love it! !